Kauffman Stadium in Kansas City, Missouri, is home to major league baseball’s Kansas City Royals. Built in 1973, “The K” has a proud baseball legacy, and goes down in history for winning two World Series championship titles; one in 1985 and another in 2015 — exactly 20 years apart. The most recent win brought a resurgence of baseball fever to the stadium, hosting more than 2.7 million fans during its 2015 winning season. The 37,903-seat stadium underwent a $250 million renovation in 2009 including an expanded concourse, new amenities, and state-of-the-art technology to make game day even more exciting. This renovation also amped up the visual experience on and off the field, installing more than 450 displays in the luxury suites around the concourse, and for back-of-house support. The displays are fed by an IPTV system, delivering live game feeds and digital signage campaigns to engage fans out of their seats and bring in additional revenue. Although the prior IPTV system was only five years old, the media players were failing and becoming obsolete. Unable to get a return on their costly investment, management had to find a cost-effective, durable replacement that would eliminate the media players’ high failure rate and reliably support live, in-venue video streaming and digital signage-wall into the future.. The legacy system also suffered from significant delay that degraded the viewing experience, either keeping fans in their seat so as not to miss the action or causing them to be frustrated when they grabbed concessions or strolled the concourse. Additionally, the existing system was cumbersome in creating and dynamically updating digital signage content. 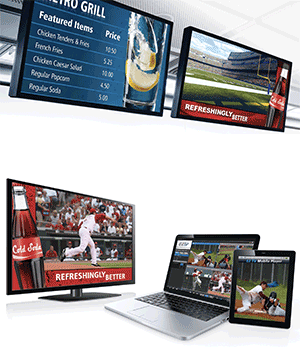 Management wanted a solution capable of delivering low-latency video around the concourse TVs and suites, featuring an easy-to-use interface for efficient digital signage creation, and the flexibility to address any arising content demands. After considerable comparisons of the IPTV products on the market, management determined VITEC’s EZ TV Platform went far beyond their requirements. EZ TV is the industry’s first broadcast-grade solution that combines IPTV distribution with powerful digital signage capabilities into an all-in-one integrated platform. EZ TV‘s flexible, open-architecture is ideal for the ever-changing video, marketing, and sales of today’s sports venues. With proven reliability, superb video quality, and under one second of delay streaming 1080p full HD (FHD) content to any screen; TVs, PCs, and mobile devices, EZ TV integrates seamlessly into existing network environments and is able to manage any type of video content including streams generated by third party encoders. With EZ TV’s extensive digital signage capabilities, system operators can quickly create eye-catching digital signs as well as dynamically updating menu boards integrated to POS vendors. Using VITEC’s cost-effective, high performance end-point behind the display, operators can turn any screen in the network into a new monetary opportunity. This eliminates the cost of two separate media players needed for video streaming and digital signage, or having to switch players to change the screen’s functionality to keep cost low. The onboard administration and analytics tools also empower the organization with campaign information vital to pulling in untapped revenue streams. A fast installation ensured the system was ready for opening day, With VITEC’s EZ TV IPTV & Digital Signage Platform fueling content into every display, fans will be treated to fresh, eye-catching digital signage content alongside superior video quality delivered with lower latency for game-day feeds as they walk the concourse. Inside the luxury suites, owners are able to access TV channels using a service-provider grade electronic programming guide and control options making them feel like they’re right at home while being right in the center of the action. For administrators and control room personnel, EZ TV offers a comprehensive set of tools for managing content packages, channel lineups for the different and central control and troubleshooting of any end-point used in the building. Every screen is an asset, able to drive new opportunities for fan engagement and revenue. It also provides unique features that will allow the organization to continue to enhance the game day experience, including menu board capabilities that automate the food services workflow and mobile streaming support that gives fans access to live and on-demand streams as the sports fan develop demand for a secondary screen experience.